"Are you clods going to sit on your butts all day, or are we going to play some ball?" With the success of the 1978 hit, The Bad News Bears, a sequel was inevitable, but the question is, how do you better the original? The answer is you don't, but you can set up another battle of the underdogs by messing with the winning lineup, and still come up with an enjoyable follow up. The Bad News Bears in Breaking Training reunites most of the players from the first film, minus Tatum O'Neal and Walter Mathau in the starring roles.At stake this year is a chance to go to Houston to play a halftime game at the Astrodome against the undefeated Houston Toros in an event sponsored (in case you missed it) by Anheiser Busch. The winning team gets to go to Japan to face that country's best, but before they can get out of California, the Bears need a new coach, and a new pitcher. The team is in disarray; Kelly isn't sure he wants to play, and The Looper is in the hospital. The replacement coach is fired, leaving the boys to come up with a substitute, since their parents aren't about to let them go to Texas without a chaperone. An unlikely candidate is found in the greenskeeper, who needs to be trained to speak even the most basic cordialities. Kelly comes up with a pitcher in Carmen Ronzonni (Jimmy Baio), a cocksure Italian with a penchant for dropping names while describing his style. After bamboozling their parents into letting them take the road trip, the team heads off to Texas in a stolen van, leaving their surrogate coach behind, but this motley group of misfits isn't about to be handed an open door to the big leagues. First, they are humiliated by a backlot team from New Mexico in a pick up game, but also run into trouble when they show up late for the Texas practices, where a ringer team is called in to replace them. They also manage to get themselves arrested when their van is towed, leading Kelly to search out his long missing father to bail everyone out and take over as coach. Things aren't looking very good as they get set for the big match, but will they find a way to pull it together before the end of the game?What makes this franchise successful is the character mix. You have the mouthy midget in Tanner Boyle (Chris Barnes), and the "cool"—by 1970s standards: he smokes, rides a motorcycle, and wears a Davey Crockett buckskin jacket, flares and mirrored shades—guy in Kelly (Jackie Earle Haley). A collection of stereotypes including the fat catcher (Jeffrey Louis Starr as Engleberg), a nerd (Alfred Lutter III as Ogilvie) and an ethnic blend allowing for all the racial slurs: dark-skinned Ahmad Abdul Kahim (Erin Blunt), the poor Mexicans, Miguel (George Gonzales) and Jose Agilar (Jaime Escobedo), and the big-mouth Italian pitcher, played by Happy Days heartthrob Scott Baio's cousin, Jimmy. Where the first film highlighted the conflict between coach and pitcher, The Bad News Bears in Breaking Training plays on the disfunctional family aspects with Kelly's resentment of his father, Mike (William Devane), who abandoned him at an early age, and who doesn't recognize him when he shows up to ask for help. Mike makes a great coach, and with the added spark from Tanner Boyle's Reagan-influenced pep talk, gets the boys mentally psyched for their opponents. The adventure is fun, even if the outcome is a given, and the number of hurdles the team faces along the way make for good drama. As a stand alone it doesn't really make a huge impression, but if you liked the first film, this one makes a decent successor, and a bridge to the third, which pretty much spoils any question as to the outcome of this one. Image Transfer Review: The anamorphic transfer is fairly free of defects, while having that 1970s look to it. Colors are well defined, black levels are solid, and there does not appear to be any edge enhancement present. The image is slightly soft, with a fair amount of fine grain visible. Audio Transfer Review: Mono audio is relatively clear, as is dialogue, though there is some mild distortion on loud passages. Frequency range is limited but natural sounding, with an even tonal balance. Extras Review: With no extras, this one's an easy out. 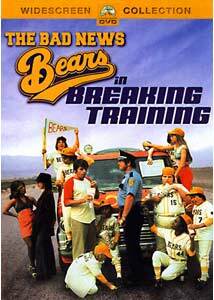 An entertaining sequel, The Bad News Bears in Breaking Training picks up where the original left off, providing more of the same, but not really going anywhere new. If you liked the characters in the first film, here's your chance to revisit them; but on its own, it is a run-of-the-mill underdog flick.